Get fired up and ready to go at the Women’s March Los Angeles. Part of a day of nationwide demonstrations to support social justice, this solidarity march starts at 9am in Pershing Square and concludes with a rally in Grand Park near City Hall. 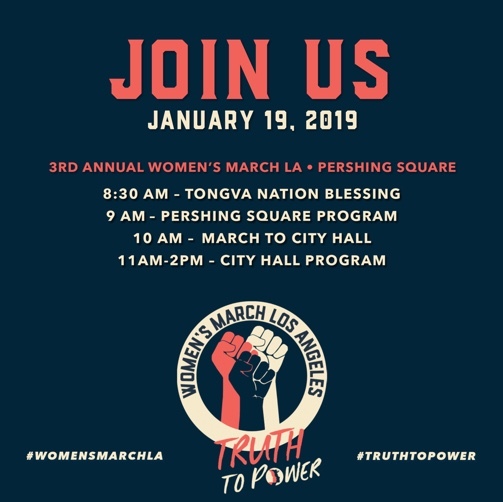 Featured guests include Mayor Eric Garcetti, Laverne Cox, U.S. Representative Katie Hill, Gloria Allred, Aloe Blacc, State Senator Maria Elena Durazo, the Trans Chorus of Los Angelesand more. In addition, the now-iconic Fearless Girl statue will appear in Grand Park along with its sculptor, artist Kristen Visbal.